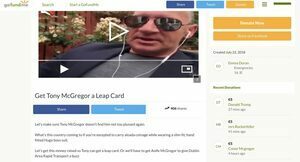 Posted in Misc and tagged GoFundMe, Tony McGregor at 1:47 pm on July 23, 2018 by Bodger. I hate people using GoFundMe as marketing on popular/viral pages. 2 of them mentioning their business, one of the saps donating €20. How can one expect someone of his class and sophistication to carry coinage. You know what they say, if you tender crisp notes, you get coinage. Maybe Irish rail should look into the issue rather than belittle their customers. How are Irish rail belittling their customers? There is no issue, the machines at Dart stations only ever give change in coins, which he is complaining about. I would personally prefer they gave notes. But the man is either trolling or he hasn’t been on the Dart in many years. I think it means that, instead of a sowing machine, they got Conor to just punch the cloth together with his bare hands. Thats a good deal, but I’d rather a FOOTBALL in the groin. He is some gowl in that video. I’m sure he passed plenty of homeless people on his travel home who would be more than happy to take the coinage so he didn’t ruin the lines on his suit. I’m surprised the guy even has €20 notes. Would think its all plastic, or at least €100’s. his instagram is worth a look- some great photos and videos. if it’s a parody, he’s a genius. Ha ha! Had a look. That man is a genius.